For 90 years, the grounds of the Roosevelt Elementary School have been a community gathering place in Ames. Our music series, Roosevelt Summer Sundays began in 2003 as a program of the Roosevelt Elementary Parent-Teacher Association. 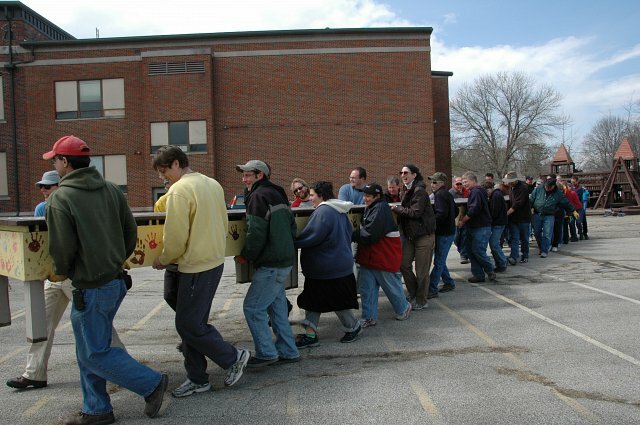 When Roosevelt School was closed in 2005, the approximately 3.5 acre property continued to serve as a vital and active hub for the neighborhood and the broader community. Roosevelt’s unique wooden playground, wide open grassy field, basketball pad and blacktop, and many shade trees drew folks of all ages. In April 2013, the Ames Community School District sold the Roosevelt Elementary School building on 2.2 acres to a local development company, RES-Development who adaptively reused the school building for owner-occupied condominiums. In May 2013, the School District Board voted unanimously to donate the remaining 1.3 acre grassy field to the City of Ames for the development of a permanent city park. This land transfer occurred in late summer 2013. Then, in early 2014, the City Council of Ames voted to include $80,000 in its Capital Improvement Plan for the development of Roosevelt Park. So, with its future secure, we now look forward to many more years of community-gathering, music, and play at Roosevelt Park! Since the land transfer took place, the City Parks & Recreation Department worked closely with the Friends of Roosevelt Park and other concerned parties to develop a Master Plan for Roosevelt Park’s development. In early 2015, Friends of Roosevelt Park led a fundraising campaign for park development, adding significant funds to the City’s basic park budget. The Friends park development campaign funded the combination picnic shelter / concert stage, a community kiosk / announcement board, and a bigger playground. The park was constructed in 2015 and 2016. We give our warm thanks to the hundreds of individuals, families, and businesses which contributed to the success of Roosevelt Park. What happened to the wooden “castle” playground? 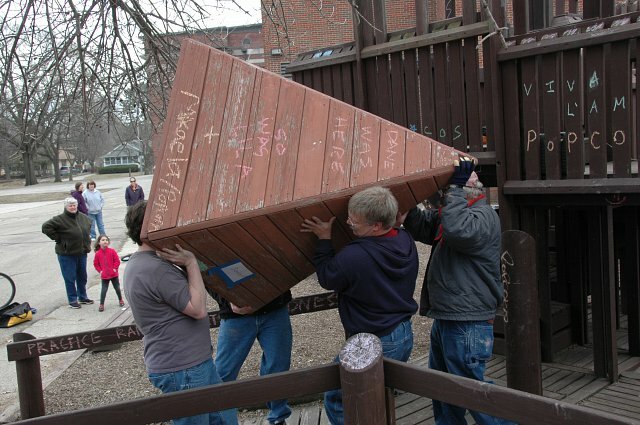 On April 7, 2013, the community gathered to say goodbye to the well-loved, community-built playground through a community work party organized by Citizens For Roosevelt Park. We salvaged some features for use in the new City park, including the 50-foot-long potluck table and the chimes. Many community members also salvaged features for use in their backyards. Have you seen a Roosevelt turret on Roosevelt Ave or elsewhere in Ames?